A portion of one of the world's rarest maps, which shows China at the center of the known world. The price tag on the 408-year-old map is $1 million. But for those of us in Washington, we get to see it for free. 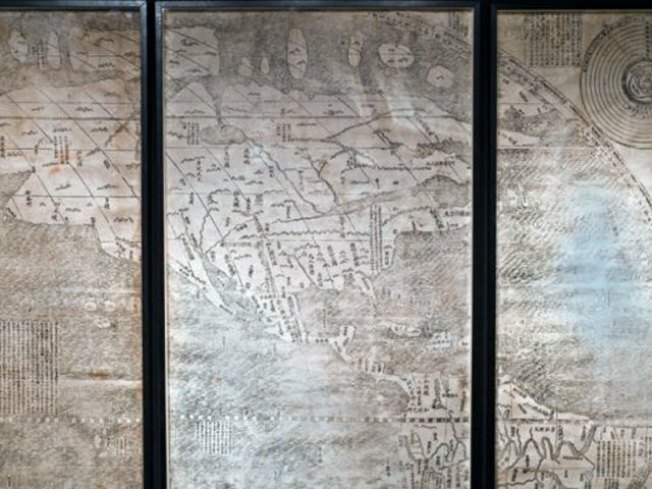 A Chinese map dating back to 1602 is now on display at the Library of Congress. The map, created by Matteo Ricci and nicknamed the "Impossible Black Tulip of Cartography" because it was so hard to find, was the first Chinese map to show the Americas. It also put China at the center of the world. The James Ford Bell Trust purchased the map for $1 million in October. That makes this the second most expensive rare map ever sold. Until then, a private collector in Japan had held it for years. After the map leaves Washington, it will eventually be housed at the Bell Library at the University of Minnesota. According to the Star Tribune, a Minnesota newspaper, the six-piece map measures 12 feet by 5 feet. It’s carved into giant blocks of wood, and then printed on six rolls of rice paper like a Chinese folding screen. The Library of Congress rarely exhibits artifacts it doesn’t own, but curators made an exception for this map. It will be on view at the library though April. The library will also create a digital image of the map to be posted online for researchers and students to study later this year. The map is on display from 8:30 a.m. to 4:30 p.m., Monday through Saturday, until April 10 in the Northwest Pavilion on the second floor of the Thomas Jefferson Building (10 First St. S.E. ).